Gauntlet is a registered charity established in 1995, run mainly by young people and a voluntary management committee including County Council representatives, Youth and Social Work professionals, Engineers, Mechanics and youth representatives. 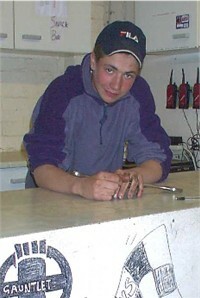 Our aim is to work as a youth project encouraging members to become involved in the running of the project. 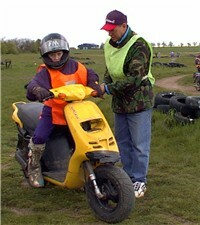 Safe motorbike riding-Young peoples self esteem - Mechanical and IT skills - Youth volunteering - Good citizenship. We aim to work especially with disadvantaged, disaffected and disabled young people - and promote the family. 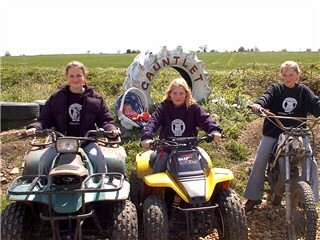 Gauntlet has a variety of mopeds and motorbikes / Go-Karts and Quads. We have a coffee bar, workshop and a seven acre field. We have a membership riding accreditation scheme, camp-outs, holidays, outdoor activities and other events to encourage self esteem building and personal development. 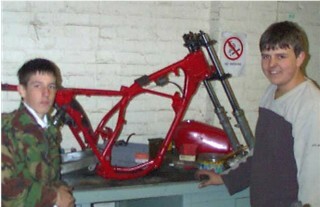 We have entered the national competition Youthbike for the last eight years and have won many trophies. All members have the opportunity to take part in these events. Gauntlet is open on Saturday Mornings for 11 - 16 year olds from 10 am - 12.30pm (Carers of any referred young people/care agency sponsored young people must contact the project and complete a Referral form before their young people may attend). Costs are £10 for non members and £7 for members. We are always looking for people to volunteer in the coffee bar / instructing / mechanical skills / IT skills / youth development - you don't need to have a lot of knowledge about bikes - just a lot of enthusiasm!